Steiff baby Sleep Well Teddy Bear, 239526 ~ Free Steiff Gift Box! "Hello - can I be your friend?" Steiff bear - Sleep Well Teddy Bear is made from baby-soft plush in a golden brown colour. She is wearing a delightful little pink dress with a white peter pan collar and has a little teddy bear head embossed on the front. 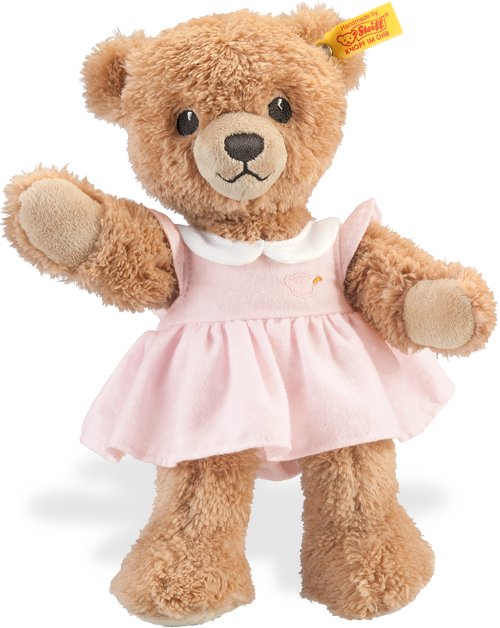 Sure to make any little girl smile, a beautiful Steiff Teddy Bear.